Sixteen voluntary WAIC-journalists gather around the collective aim to make this World Conference become World News. Together with you, this team makes generative news that connects and scales up the best of this event. A constant stream of Appreciative Inquiry news will be available for those gathered at the conference as well as for the outside world. With these news efforts, the team will reach out to people from all over the world who can’t be in Ghent. Every morning, The M-crew will deliver a WAIC Morning News Paper, highlighting the events of the day before and looking forward to what’s coming up. Find the M-crew at the Media Desk, on the first floor. Follow the news on www.2012waic.org or on your app. Co-create the news by posting your comments on the website, or post an article, blog, picture or video on our pages on facebook. Spread the news in your networks. 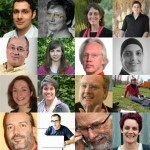 Tweets with #2012waic are published at our website.